Center may give a "green" signal to Dow Chemicals? Even as the Alumni of various Indian Institutes of Technology (IITs) team up to put pressure on the institutes to prevent campus interviews being conducted by Dow Chemicals (which now owns Union Carbide)…. ….it’s a totally different scenario at the Center. 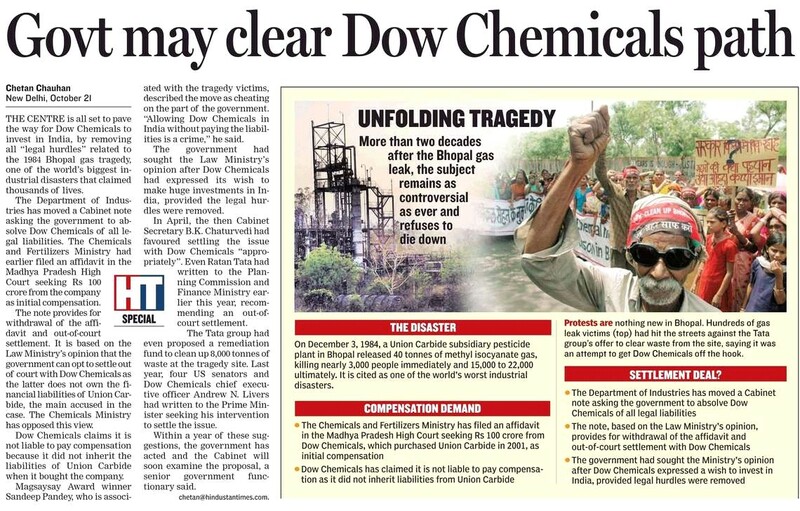 Far from banning the entry of Dow Chemicals into the country, the Center is gearing up to give the company a green signal to invest in India – even when the people of Bhopal are still suffering from not just the horror of the Bhopal Legacy but also from the threat of contamination from the chemicals that still lie around the site. It would not speak good for the Government if such a clearance is actually given and Dow Chemicals be allowed to plant such time bombs in this country. Tons of chemicals lie abandoned at the Union Carbide factory in Bhopal, poisoning the environment and people’s lives. PrevAnother feather in Delhi Metro’s ‘green’ cap! DOW CHEMICALS – GO BACK……………. What else can we expect from the govt when it has not even done (or let somebody do) a proper survey of the total number of people affected during the bhopal gas tragedy. Unless citizens and civil societies strongly demand justice, it will be delayed forever. What the Govt. is doing now is even worst than what Union Carbide wrong-doings. Justice should be delivered to the affected people of bhopal. 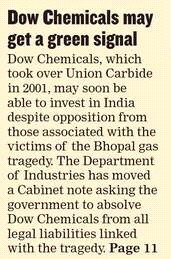 Dow chemicals should be sent back until they hand over the culprits of the bhopal gas tragedy to India.